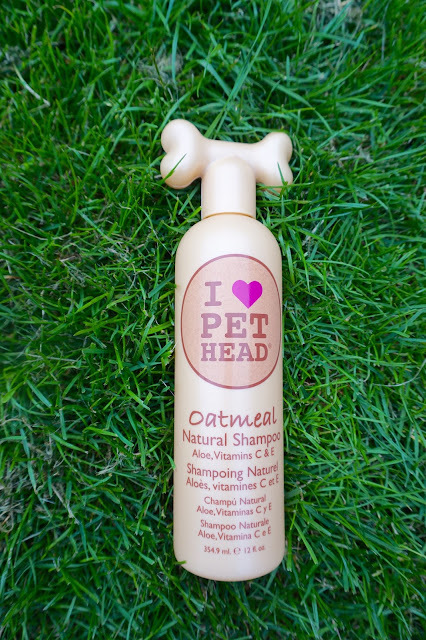 Today I want to talk about a shampoo that I use on my pampered pooches, and that is the Pet Head Oatmeal Natural Shampoo. As you know I use Kerastase on my own hair, and want to use something equally as good on my dogs fur. I switch up their shampoos all the time depending on what’s available and the condition of their coat, but Pet Head is a brand I trust and use regularly. I get mine from Pets at Home for £9 for a 354ml bottle. Pet Head describes this shampoo as ‘comfort for your dog. Natural shampoo blended with oatmeal, aloe vera, and vitamins E & C, heal and protect sensitive skin. Jojoba oil and oatmeal work together to moisturise the skin and soften the coat’. I find the shampoo very moisturising for Molly Mouse’s skin in particular which is very sensitive and prone to dryness. I still need to follow up with a conditioner after using this, as I find the shampoo on its own isn’t enough. Overall I find it soothes the girls skin and does a good job of cleaning their fur without stripping it of its natural oils. The thing that sets this apart from other dog shampoos is the scent. I keep this in my bathroom cupboard and whenever I open it I can smell the strong scent of amaretto. De-lish! Based upon this alone I would definitely repurchase this shampoo.